For our Rain Barrel Construction project, we chose to build our own system. We used food-grade barrels purchased locally. To find a local supplier of food-grade barrels, just use your favorite search engine to search on "barrels" and your zip code for local sources (barrels 99999). We researched several designs for our project. They all had their advantages and disadvantages, so we kind of made it up as we went. If you are handy, it shouldn't be too hard to make your own custom system. 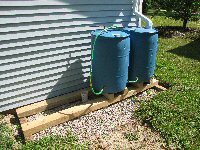 Listed on the previous page are several how-to sites and sources for rain barrel accessories. We purchased our barrels locally at Container Compliance Corp. We then scouted the local hardware store for the fittings necessary to connect the barrels to the gutters. This is where a lot of thinking and studying the different pieces-parts came in. For the intake, we settled on a PVC fitting for connecting gutters to drains. We cut a hole in the top of the barrel and placed the fitting in the hole. Since our system consists of multiple barrels, we wanted them to interconnect in an efficient manner. We chose to connect them at the bottom of the barrels rather than the top. This allows for the barrels to fill and drain evenly and allowed us to only have one hose bib that drains them all. To connect the barrels we used a brass barbed fitting, sections of garden hose and hose clamps. If you choose to connect them at the top, you will need a hose bib for each barrel. We also added a vent in each barrel to allow the water to rise and fall. There needs to be a vent so that air trapped in the barrel can escape when the water rises and falls. This is importatnt to the efficient operation of multiple barrels. While not visible in the photo, we will allow for overflow into our drain system. The large white pipe coming from the ground in the photo connects to our drain. We have around $100.00 invested in our system. We will probably add 1 or 2 more barrels bringing the cost per barrel of storage to well under $50.00 each for a flexible and expandable rain water storage system. Connect your system to the cleanest roof available. One side of our house has trees and the other doesn't. The side of the house with the trees collects dirt and debris much quicker that the side without. Water is heavy! Be sure that whatever you place your rain barrel construction project on is sound and level. A full 55 gallon barrel weighs over 400 lbs. We placed ours on 4x6 treated timbers with 4x4's directly supporting the barrels. The 4x6's were placed on buried 4x4 sleepers to help keep them level. Make sure that you have space below the hose bib to drain the water. Alternatively, you can connect a hose to the hose bib to take water from the barrels, but the flow of water will stop once the water level in the barrels drops below the hose end. Roofs can collect a lot of water in a short time, so using an overflow or diverter is essential. A rainfall of 0.1" yields 0.062 gallon per square foot. The roof that feeds our system is approximately 15'x50'. This amounts to over 40 gallons of water from just 1/10 of an inch of rain! 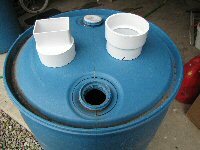 Consider different design options for your rain barrel construction project. The barrel pictured here places the barrel bungs on the bottom and uses the pre-threaded hole in one of them to insert the hose bib, eliminating the need to drill a hole in the barrel. The rain barrel in the photo is sitting on plastic buckets. This is for illustration purposes only- remember how heavy the full barrels are. When drilling the barrels for connections, use a sharp spade bit, not a wood auger. The spade bits drill a cleaner hole. An alternative is a step bit or Unibit. If we can find ours, we'll try that on the next rain barrel. Finding the proper hole size for the fittings is a little tricky, so be careful. We tried using a pipe tap for the hose bib and it really didn't work well. The tap was also very expensive. We ended up sealing all of the connections with silicon caulk to keep them from leaking. Remember that standing water can become a breeding ground for mosquitoes. Do not leave any openings for them to get in. Some designs have a large opening for the water to enter. These are usually covered by screen to filter out leaves and debris, but they also serve to keep the mosquitoes out. You can save a lot of money by building your own rain barrel construction project by looking at what's out there and adapting the plans to fit the materials available.